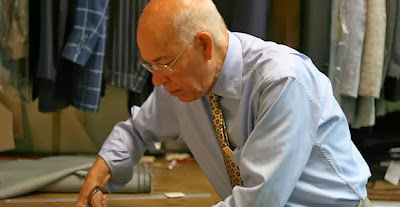 Tailors Nino Corvato (in New York-pictured above), Joe Centofanti (outside Philadelphia), and Checchino Fonticoli (in Penne Italy ) are the subject of Vicki Vasilopoulos's film on the dying art of tailoring. Following the men over a period that turned out to be 11 years the film shows what it takes to be a tailor of the highest level. The question of how with the art and profession survive when the master tailors are dying out and very few are willing to step up and learn. This is a really good, nearly great film. A slow deliberate film that is structured in the same way as one tailors a suit, the film gives us the stories of each of the men and shows how they have dealt with changing times. The film also introduces us to Joe Genuardi who, after a stint at Carnegie Mellon decided to take the long hard path and become a tailor by apprenticing himself to Joe Centofanti. Through the stories, the structure and the appearance of Genuardi we get a fantastic sense of what it takes to make fine suits. We get to feel the love of the men for their job and we understand just how special handmade suits are. I, a man who will never have the term fashion sense attached to my name, was enraptured at times. I wanted to go out and sell my grandmothers so that I could afford a suit made by one of these craftsmen. You will care about the men and what they do. You will feel a loss at the notion that their way of life is fading from existence. I love films that make you feel and this one does in spades. I said that the film is near great. What I mean by this is that the film is a little too long. Running a just under 100 minutes the film seems to go on in several sequences. Its nothing fatal, rather its simply a bit too much sewing. Slight reservation aside the film is recommended for anyone who wears clothes and even those who don’t.